Is it me or are the Americans looking even more portly? There’s a new treat on the market. A looming threat of the most cutting edge in technology. No! I’m not talking about the remake of Total Recall! It’s salty and sweet threat… No! I’m not even talking about the city’s answer to cleaning up the streets with its ‘chocolate covered homeless’. (Eeewwww). Having said that, we have a new champion! 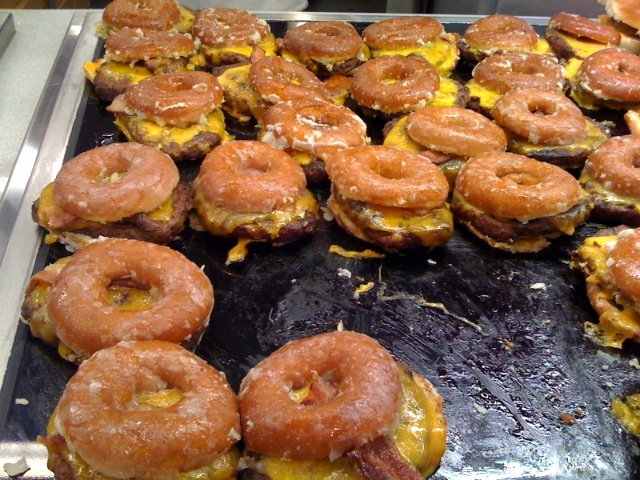 A HAMBURGER, but instead of buns, wait for it… Krispy Kream donuts!! It may actually be the very first hamburger that can cause a heart attack after the first bite! Diabetics would probably explode into a very fine “sugar-free” mist. Shouldn’t we be inventing stuff like, oh, I don’t know… a chocolate bar that makes you constipated? How about a cake that’s made entirely out of weight loss pills? Or popcorn that fills you with self loathing? Do you think that people haven’t thought of this before? Of course they have! It’s just no one ever wanted to get that lonely and find themselves sitting around cooking a hamburger and deciding to book end it with a couple of donuts. I have an idea for the EX. Let’s just have a trough! A nice big metal trench where we can order whatever we want, it gets all nice and mixed together, and we can get on our hands and knees and really pig out the way nature intended. That’s where we are headed, a trough. A big, metal, meat and Oreo filled trough! Later, I’ve gotta go enjoy a nice strawberry and tuna milkshake!